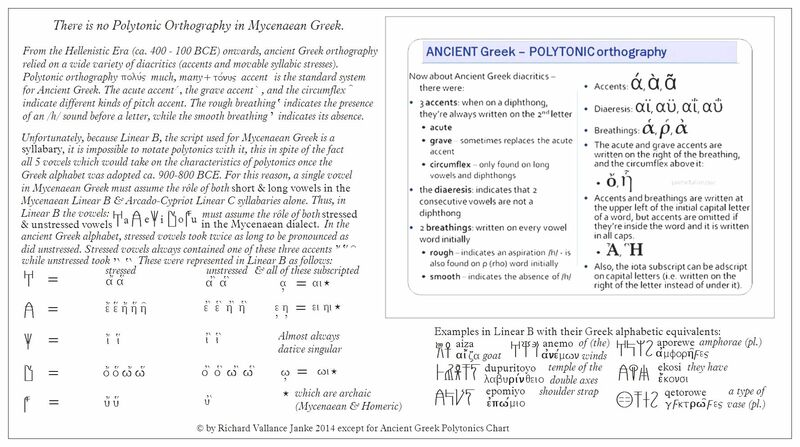 Peering at this (apparently) complex chart of ancient Greek polytonic orthography, you are liable to want to jump off a cliff or at least take a valium. I know I did when I first learned ancient Greek, and to be quite frank, I still do have a great deal of difficulty remembering where stressed or unstressed accents (especially when subscripted) are supposed to fall, either on the first syllable or on one of three final syllables, which are linguistically stylized as antepenultimate (third last syllable), penultimate (second last syllable) & ultimate (last syllable), just to drive us even crazier. We can blithely (and safely) ignore these totally unnecessary definitions and just say last, second last & third last syllable, so that ordinary folks like you and me can understand what on earth all those linguists are on about. And I am the first to admit that, even though I learned ancient Greek all on my own (auto-didactically), and have learned to read it very well after 15 years, I always was and still am far too lazy to be bothered learning the niceties of all those polytonic “rules” anyway, because all you need to do, in order to write ancient Greek, is to look up the word you want to write in an excellent Greek dictionary, of which by far the best is Liddell & Scott, Greek-English Lexicon (1986), grab the correct polytonic accents from the entry, et voilà! And I know darn well right that plenty of folks do precisely this, because who can be bothered with silly details like that if in fact you already know the word for which you want to check its polytonics. This is above all true for those of us who have read plenty of ancient Greek texts, from at least Books I & II of Homer’s Iliad, several prominent ancient Greek poets such as Sappho (above all others), Anacreon & Alceus, historians such as Herodotus & Xenophon (ridiculously easy to read & my first introduction the ancient Greek), Plato, Strabo, Plutarch etc. etc. (all of whom I have read extensively, plus many other authors in several ancient Greek dialects – another maddening distraction, at least for the first five years or so). It is in fact the dialects, of which there at least 10 major ones, all of them treating polytonics in their own quirky way, which really mess things up! Trust me. Add to this the incontestable fact that ancient Greek has far more polytonics than any Occidental language, ancient or modern, and you can see exactly what I mean. Even French, which sports plenty of accents, is a cakewalk in comparison. As a Canadian, I speak and read French fluently, and I can and do remember precisely where any accent falls on any French word, all this in spite of the fact that French has a number of accents – though far, far less than ancient Greek. look up the author and subsequently the passage you want to transcribe, and then copy and paste it into your word processor, simple as that. Well, not quite as simple as that. You have to make sure that you have first set your font to SPIonic (the best there is for most dialects – but not all – in ancient Greek), to make sure that it turns out as Greek in your word processor. Otherwise, all you will see is nothing but garbage. This situation gets far more frustrating for those of us who can also read and write Minoan Linear A (even if no-one has a clue what it means), Mycenaean Linear B & Arcado-Cypriot Linear C (all of which, thank God, have no polytonics!). Now if you wish to set the exact Greek equivalent of any Linear B text, for example, if you do not do as I advise, it will take you hours and hours just to type a few sentences. Who needs that like a hole in the head? Not me, let me tell you. But of course our chart above serves to save you hours and hours of totally needless fooling around with ancient Greek diacritics. Just print it out, laminate it if you like, and pin it on your wall. Then you can gaze at it in stunned awe any time you like. Even without doing this, it takes me hours and hours to create a chart such as the one you see above. That one took me four hours! So I really would appreciate it if folks who visit our blog actually get this, and at least tag each post they really find fascinating with the number of STARS they would rate it as (top of the post) & LIKE (bottom of the post). Please! It makes Rita, my colleague and myself very happy to know you care.